Literature features abound on a major publisher's Web site. RandomHouse.com/kids offers parents, teachers, and students links to information on childrens books and authors published by Random House. In addition to up-to-date information, the site offers mini-sites focusing on specific book series and authors, such as The Magic Tree House, Sesame Street Books, and Thomas the Tank Engine & Friends. These mini-sites have fun activities, screen-savers, and some multimedia content related to Random House authors and products. Light-colored backgrounds, professional graphics, and black print make this site easy to read. This site is very attractive, featuring childrens book covers and other professional childrens book illustrations. The format of this site leads to enjoyable and efficient navigation and ease of use. Links are well organized and easy to follow. There are links to information about each author in addition to links with specific ideas for book usage. This professional site offers tons of information for teachers that use literature in their planning and teaching. Many teachers use book series to engage young readers. Mini-sites like the one about Junie B. Jones have book reviews, activities, ideas, author information, and the occasional trivia quiz. 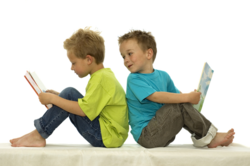 The site has links to reviews of childrens books searchable by title or author. In addition, new books are highlighted and pages can be previewed for some books. There is a Games and Contests section that links many fun activities for students at many ages. The link to [email protected] provides teachers guides and readers companions for many of the same books. This site provides resources for anyone interested in using childrens literature in the classroom, home, or caregiver experience. Although this is a commercial site, intended to help sell the company's products, the number and quality of free online features makes it a good teaching resource in itself.